A nineteenth-century general sits atop a mound of skulls. Set against overlapping neon pink and yellow backgrounds (the aluminum support adding an incongruous sheen), the general and his sword, plumed helmet and squat pose summed up a satirical critique of Whig politics in the 1848 Currier & Ives print from which Kathryn Andrews worked. A plexiglass panel along the piece’s right edge reveals the folded costume of the Joker, worn by Jack Nicholson in Tim Burton’s “Batman.” American politics has long been the province of murderous fools, but what, precisely, does Andrews offer in her argot of visual culture? What does it mean to repurpose old satire as new satire? 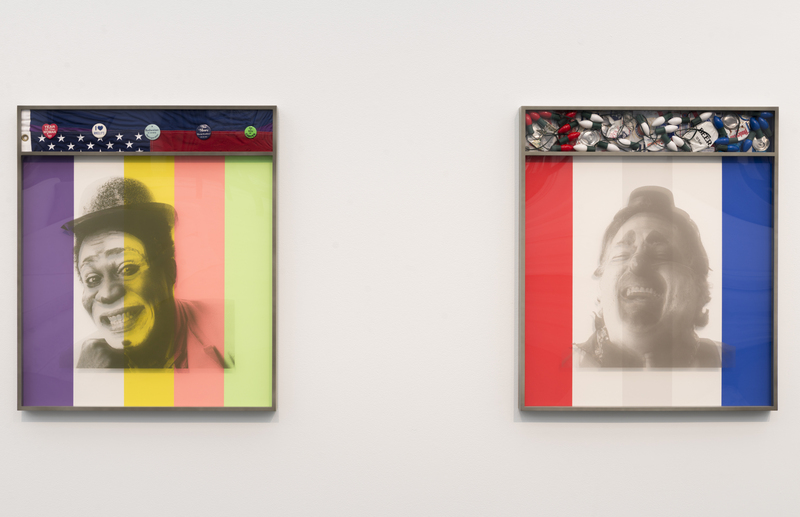 Andrews lays waste to the scene of electoral politics in a variety of sculptures, prints and multimedia works. Her heavily coded salvoes reference James Bond, AIDS activism and Happy Meals. While some of her objects are formally complex, and some of them relate to each other in a highly intentional manner, they rarely reward close study. The strongest works are also the biggest and boldest; after all, the links between film, politics and spectatorial suasion are brassily articulated in life as well as art. 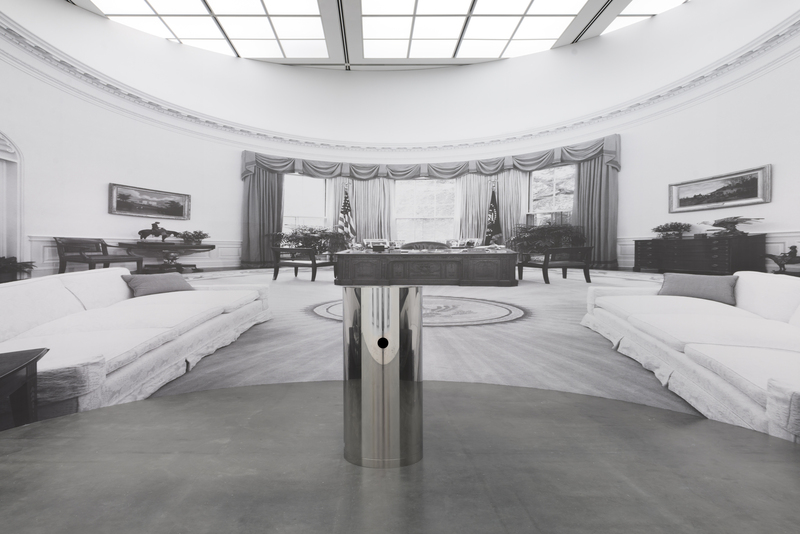 “Lethal Weapon,” a large-scale installation, sets the viewer in a black-and-white photograph of the Oval Office. Moving around a central, cylindrical mirror which corrects the backdrop’s anamorphic distortion, I caught myself thinking afresh about Mel Gibson and the manipulative force of blockbuster democracy.